New York City - What to See First? So Much To See... What First? New York City is a favorite for travelers from the United States and for visitors from around the world. Right up there with London, Paris and Rome. So where do you start with a city that offers so much? Well, any self-respecting tourist has to hit the tourist highlights. Unless you have a particular agenda you'll probably want to visit this short list. You can certainly see New York City on your own, but if your time is short or you'd like a quick overview, you might want to consider a city tour. Another option is to check into one of the sightseeing city passes that are available; they can save you time and money. 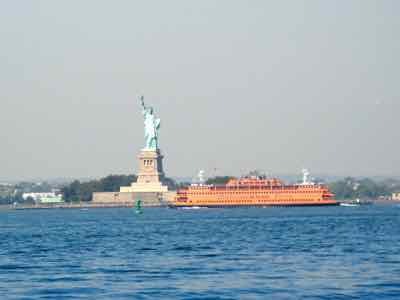 Catch A Ferry To The Statue of Liberty. To start with you'll probably want to visit Lady Liberty. She is a proud symbol of the U.S.A. There is no admission fee for the island that she stands on, but you must buy a ferry ticket to get there for about $12 for adults. If you want to go into the monument, you must reserve a free "Monument Pass." These passes are time specific, meaning you have to go IN at the time you have reserved. Security onto Liberty Island is as serious as it is for getting onto an airliner these days. It's apt to change, and we can't always keep up with it, so check before you go. You'll have to clear a security screening before boarding the ferry. There will be a second security screening if you have a Monument Pass for entering the monument. Allow plenty of time... probably 2-3 hours. Look For Your Roots On Ellis Island. This is where so many immigrants entered the U.S.
Again there is no admission fee, but you must pay for the ferry. Both of these attractions are only a short ferry ride from Battery Park. The ferry circles from the Statue of Liberty to Ellis Island and back to the city. Check the ferry schedule for details. If you just want to see the Statue of Liberty from the harbor, you could take the free Staten Island Ferry from Lower Manhattan over and back for great photo opportunities of both the statue and of the city skyline. This iconic building in New York City is still a favorite. Take the elevator to the observation platform for a great view of the city.There is an admission fee, and often a long line. The Memorial stands on "Ground Zero" of the terrorist attacks of September 11, 2001. You may stop and reflect at the Memorial. Tickets are required to enter the Museum. The Metropolitan Museum of Art has an extensive collections of painting and ancient art. It is located on the east side of Central Park at Fifth Avenue and 82nd Street. The American Museum of Natural History is on the other side of the park at Central Park West at 79th Street. See the Museum of Modern Art and the Guggenheim Museum. Or try the Frick Collection to see stunning art and get a peek at what a New York mansion from the early 1900s looked like. 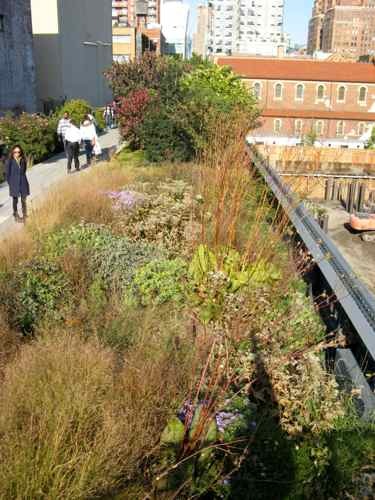 The High Line is a park on an old rail way bed. It's an interesting way to view the city. There are lakes and open spaces right there in the middle of the city. It's a great place to get away from the hubbub of the city and maybe have a picnic. We have travel buddies who live it Brooklyn. The whole area has been revitalized, and it's a great area to explore just in case you run out of things on Manhattan. 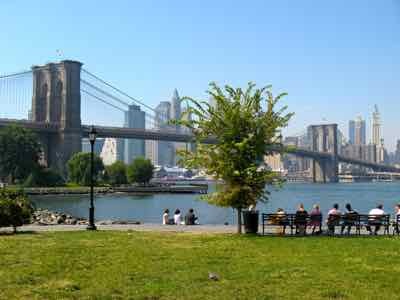 It's fun to walk the Brooklyn Bridge, and the Brooklyn Bridge Park has great views back at the Manhattan skyline. And if that's not enough, how about a little shopping or at least window shopping. Take a stroll down Fifth Avenue. See Times Square where New Yorkers and visitors celebrate New Year's Eve and where you can find out more about Broadway plays. Cabs are plentiful and the subways can get you close to most of the highlights. And all this is just for starters, so bring good walking shoes and enjoy New York City. For more U.S. travel, we've got our ideas on other things to see in America... at least the few places we've had time to write about. Enjoy!